Thank you for the Mandela Day donations that have been brought into school for the underprivileged. We will hand them over to a N.P.O. called Touch of Hope. The school will be closed on the 3 August – Voting Day. The school will also be closed on Monday 8 and Tuesday August 9 August – Women’s Day. 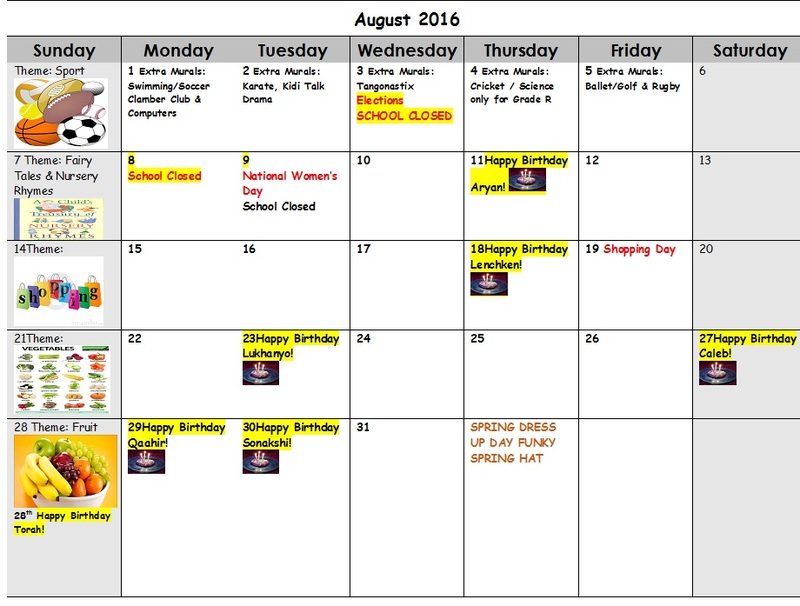 ACTIVITIES ORGANIZED FOR THE CHILDREN DURING THE MONTH OF AUGUST. During the 3 day week of 10, 11, 12 August the theme is Fairy Tales. On Friday 12 August the children can dress-up as their favourite Fairy Tale character or Super Hero character. The teachers will be face painting the children. Shopping Theme 15 – 19 August. We are going to have a shopping day experience on Friday 19 August. Each teacher is going to set up their classroom to represent a “shop” such as an Ice Cream Parlour, a Bakery, Juice and Fruit store, Popcorn Shop as well as a Fish and Chip Shop. The children will then be able to purchase from each shop. The aim of this activity is to teach the children the concept of bartering, that you need money to buy things that we want or need. We request that the parents give their child coins not exceeding the value of R10. To celebrate the beginning of spring. Please dress your child in very summery clothing as well as a bright and colourful funky spring hat.